Heat a large sauce pan over medium heat. Add coconut oil and onion with a pinch of sea salt. Cook until the onion begins to turn translucent. Add celery and a sprinkling of sea salt. The idea is to add a touch of salt to each ingredient that is added to the hot pan, this is a chef technique that brings out the flavor in each component of the dish. Add red curry paste and stir to coat vegetables. Add a splash of water if the pan is too dry. Add chicken, ginger, garlic, and a pinch of sea salt. Stir to coat everything. Let cook, stirring occasionally until chicken is about half way done, about 5 minutes. 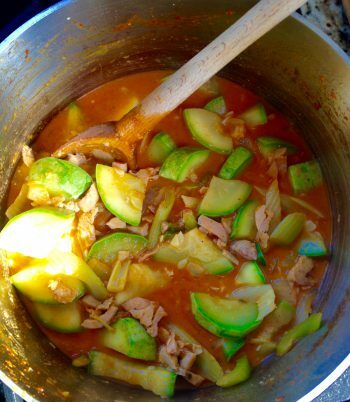 Add zucchini and a touch of salt, stir gently and put lid on to cook for another 10 minutes. Water should release from the zucchini as it cooks, so adding water is probably not necessary, but add a splash if pan is too dry. Turn heat to low, add a can of coconut milk, stir it in and warm through, about 1 minute.